As colder weather begins to arrive in Texas, we know that a steaming plate of enchiladas warms you up in a way that only Tex-Mex food can! For those with renal disease, the Tex-Mex staples of salty meat, cheese, and tomatoes can make a kidney-friendly Tex-Mex meal seem impossible. But here, we’ve done it! (Because that’s what we do! We make livable lovable food for renal diet!) We focused on all the renal “can-haves” of the Tex-Mex diet such as flavors of green chile, cilantro, and warm spices. We cut back on potassium by swapping out red peppers for tomatoes and added a special sweet tang with some pineapple. 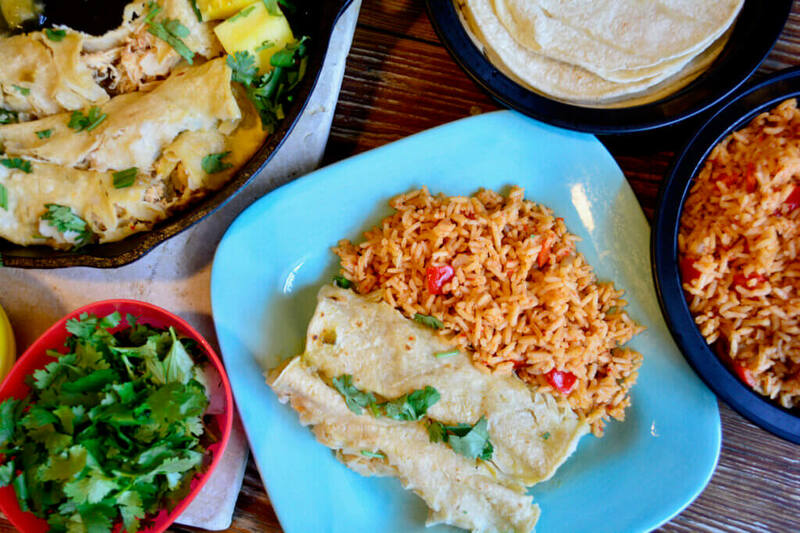 We’re giving you a guarantee that this meal of pineapple chicken enchiladas and red pepper Spanish rice is a kidney-friendly way to satisfy that Tex-Mex craving! This is a protein heavy dish, which is great for people on dialysis. If you have earlier stage kidney disease and are limiting protein. Try adding produce such as sliced red and green peppers and onions to cut the protein down. You can also play with using rice as part of the filling to really stretch the meat if you’re on a budget or needing to cut back on protein in general. When looking for corn tortillas, check the ingredients list for any added phosphorous. I was able to find a white corn tortilla by the brand La Banderita with no extra phosphorus (This is no easy task…phosphates are everywhere in tortillas!). We also opted for a fresh chicken without any added phosphates. In a small bowl, mix enchilada sauce with 2/3 cup water. Add 1/3 cup of the enchilada sauce to the skillet and continue cooking. Add in 1/2 cup pineapple, 1/4 cup green onions, a dash of paprika, cayenne, and cumin to taste, and cook until chicken is just done. (You can also use any spices or taco seasonings of your preference – remember to look for low sodium seasoning mixes). Place chicken and pineapple mixture into a bowl and set aside. Heat tortillas one a time for a minute or two in the skillet to soften. 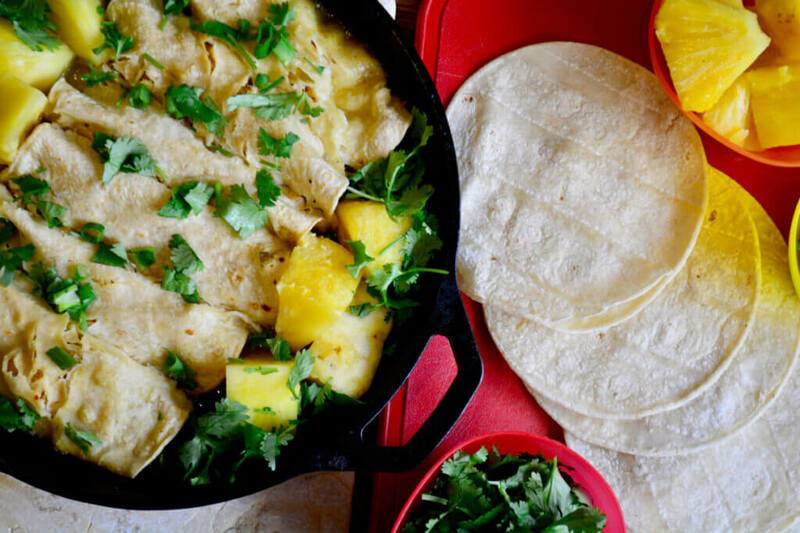 To make the enchiladas, place a large spoonful of the chicken and pineapple mixture onto the tortilla and roll it up. Place each enchilada side by side in the baking dish to hold rolled shape. Pour the remaining taco sauce over the top. 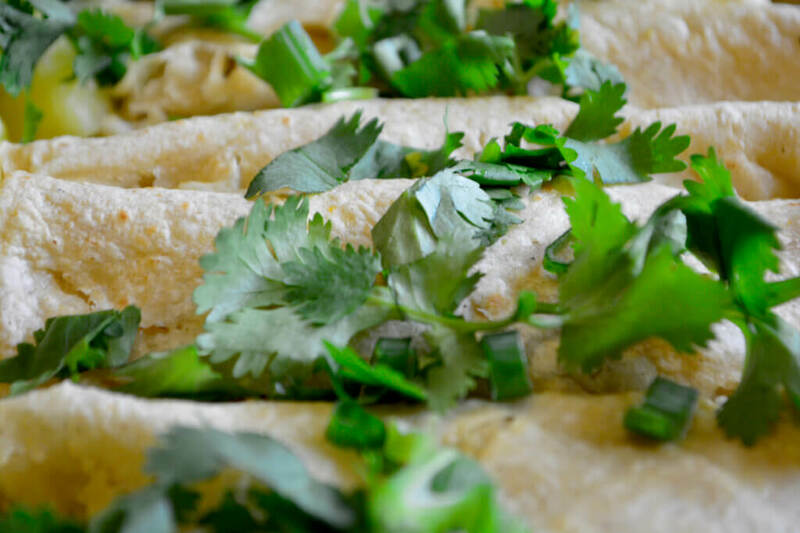 Top each enchilada with remaining green onions and cilantro. Serve and enjoy! In a skillet, sauté onions and red pepper in olive oil over medium-high heat until softened. Add rice to skillet, and stir continuously until rice is lightly browned. Add garlic powder, chili powder, red pepper purée, and water to skillet. Cover and simmer on low heat until all water is absorbed and rice is tender, about 15 to 20 minutes. Serve with wedges of lime, and season to taste. Enjoy! Preheat the oven to 475 degrees. Line a roasting pan with foil, and place the peppers on the pan. Roast the peppers, turning them every 10 minutes for an even roast. Roast for about 35 to 40 minutes, or until the peppers are tender and collapse. Remove the peppers from the oven and allow them to cool before handling. Peel away the skin, remove the core and seeds, and discard. Place the peppers and olive oil in a food processor, and purée until smooth. Refrigerate for several days or freeze for up to a month. For the Red Pepper Puree: We recommend making this roasted red pepper purée ahead of time and freezing it. This is a versatile, “blank slate” tomato product substitute that will easily find its way into many Mexican and Italian dishes. Make a full batch and freeze for use as needed! 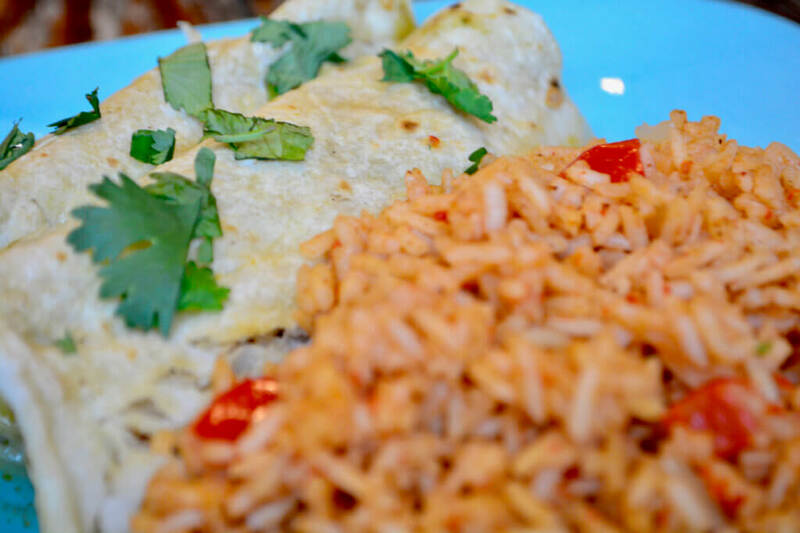 We loved this kidney friendly Tex-Mex meal! The enchiladas are full of flavor, with just the right amount of spiciness from the cayenne pepper and a subtle sweetness from the pineapple. The rice has the same characteristic red hue and tomato-like flavor of Spanish rice (without the tomatoes!) thanks to the roasted red pepper purée and diced red pepper. We found that a couple squeezes of lime juice really helped to bring out all the flavors in this dish. While we would gladly enjoy this meal any time of the year, the red and green colors lend themselves especially well to the holiday season. 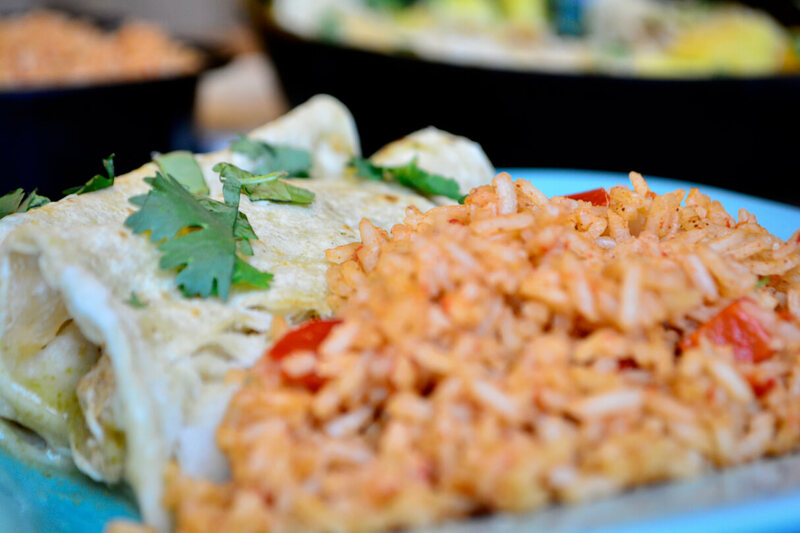 We recommend our enchiladas and rice as a kidney-friendly substitute for Christmas tamales, or as a quick, healthy meal when hosting a crowd during the holiday season!